I got a very surprising phone call today. The producers of Kathy Griffin's My Life on the D-List telephoned me to tell me that I will be appearing on the show that airs next Thursday, August 7. I was surprised for several reasons. First I was surprised that they would call everyone who was to appear on the show to tell them that they were going to appear on TV. Next, I was surprised that I was appearing on the TV show. Sure, I was around when the crew was filming an episode, and the camera was on me when I was talking to people, but I assumed ever since that day that all appearances of me would be edited out. I didn't say anything very interesting while on camera. 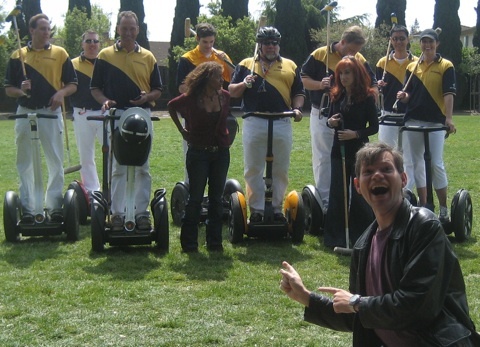 Me in the foreground with other famous people behind me, including Woz, Kathy Griffin, and Rachel True. I have no idea how much of me will be on TV. I assumed that the most I would appear would be walking around in the background. That still may be the case. Perhaps the producers were just calling everyone they had a release for, whether or not they made the final cut or not. Anyways, be sure to watch for me. It's My Life on the D-List on Bravo on the episode that airs on Thursday, August 7, 2008.